U.S. President Donald Trump insisted Sunday that White House lawyer Don McGahn isn't "a John Dean type 'RAT,"' making reference to the Watergate-era White House attorney who turned on Richard Nixon. Trump, in a series of angry tweets, blasted a New York Times story reporting that McGahn has been co-operating extensively with the special counsel team investigating Russian election meddling and potential collusion with Trump's Republican campaign. 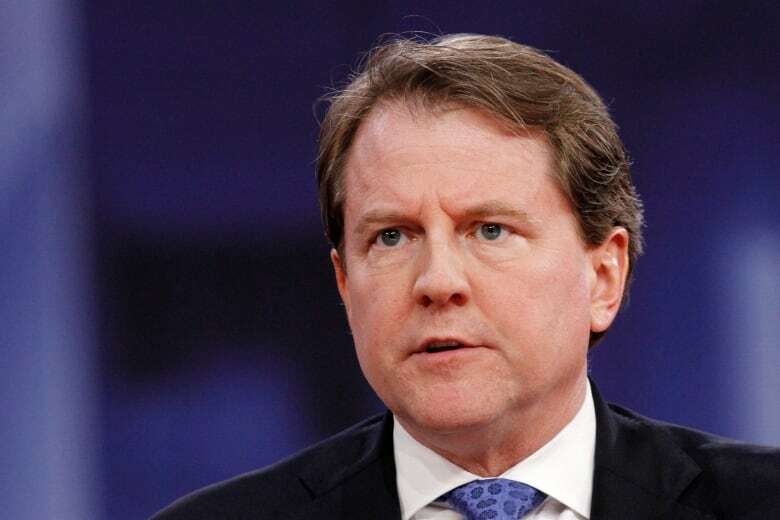 "The failing @nytimes wrote a Fake piece today implying that because White House Councel Don McGahn was giving hours of testimony to the Special Councel, he must be a John Dean type 'RAT,"' Trump wrote, misspelling the word "counsel," as he often does. "But I allowed him and all others to testify — I didn't have to. I have nothing to hide…"
The New York Times said in a tweet that it stands by the story. Trump's personal attorney, Rudy Giuliani, said in an appearance on NBC's Meet the Press that Trump didn't raise executive privilege or attorney-client privilege during those interviews because his team believed — he says now, wrongly — that fully participating would be the fastest way to bring the investigation to a close. Dean was White House counsel for Nixon, a Republican, during the Watergate scandal. He ultimately co-operated with prosecutors and helped bring down the Nixon presidency, though he served a prison term for obstruction of justice.